Akira Armstrong was frustrated. Although she has years of professional training as a dancer, Akira found herself constantly cast aside rather than cast in roles. To her profound frustration, she couldn’t find an agency to represent her. After receiving little more than a “side eye” from talent selectors and agents and witnessing nothing but lean limber ladies getting selected for work, Akira was pretty sure something wasn’t right. Akira knew that any rejection was not due to a want for talent, after all she throws down on stage and in auditions. But for some reason, her skill wasn’t landing her where she wanted. She had training, talent and charisma. What she didn’t have, was the classic dancer’s body type. It was after one particular unsuccessful audition in New York, she took a step back, squinting. 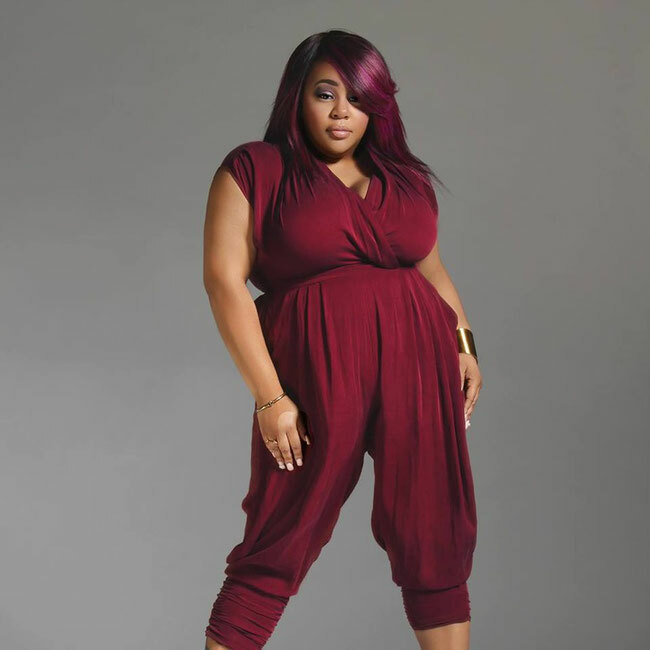 She took a look at the bigger picture and didn’t like what she saw: The majority of dance agents were unwilling to represent a plus sized dancer. She wasn’t getting work because she was unconventional. Influenced by the classic ballet body type, the dance industry is known for its favoritism toward slim ballet-style body types. In the late 1700’s, French ballerina Marie Camargo became so popular that dance companies began to select dancers that fit Camargo’s measurements only. She was slim, light-footed and dainty. Previous to Camargo, dancers of all body types were trained and cast. As the longevity of the Camargo body type in ballet and in other forms of dance illustrate, there is an obvious body prejudice in the institution of dance itself. An elite school will, in general, adhere to a standard body type. The main reason for this is due to the opposite gender: the men. Young male dancers, especially in ballet, need to be able to lift their partners during classic duets called pas de deux. If a dancer is too heavy for her partner, the pas de deax is over. In 2017, the dance industry continues to uphold the Camargo body type as the true figure of dance. Assuming that all professionally trained dancers have a background in ballet, there is an assumption that dancers without a ballet body won’t make it through its rigorous training. Mainstream dance has, thus, codified “the dancer’s body” as a narrow door through which only the slim may walk. To be fair and in general, body standards for ballet and dance have changed over the decades. We have begun to see more body-type diversity on the stage in recent years. However, when we do see it, it tends to be romanticized by popular media. Take pop-star Joe Jonas’s 2016 music video “Toothbrush.” Entertainment magazines couldn’t stop asking him why he chose plus size model Ashley Graham as his love interest in the music video. When we do see plus sized women on screen, the media commends itself for recognizing the anomaly, as if to pat itself on the back for disproving a prejudice that they have silently endorsed. Like Ashely Graham, Akira debuted in music videos as well. She was a background dancer for two of Beyonce’s music videos in 2007, “Green Light” and “Get Me Bodied,” but the honor was rare despite her training. Classically trained in ballet, jazz, modern dance, and hip hop, Akira’s been dancing since she was three years old. She began her dance, drama, and vocal training at Mind Builders Creative Arts Center, where she was selected to participate in a high-level merit program. She is also a former student of the prestigious Ailey School. Since its inception, PBM has participated in Ladies of Hip Hop, Carnival (choreographers Ball), Ms. Full Figured USA pageant & Press Release, the 3rd Female Hip Hop Honor Award Show, Salt N Pepa, Lane Bryant’s “'I’m No AngeI” campaign (a response to Victoria’s Secret’s Angel icon), NY fashion week (Plus is Equal), Full Beauty commercial, Mz007 concert, and competed on NBC’s America's Got Talent Season 10. While praised by many for her company management, choreography and rising fame, Akira claims that one of the biggest challenges was getting her message across concisely. ”A lot of people are saying that we are promoting obesity and that's not necessarily the case. We just promote body positivity,” she claims. Often times we see mainstream media conflating two very different messages. To be clear, body positivity is not the same as glorifying obesity. Pretty BIG Movement is comprised of classically trained and rigorously disciplined dancers. These women, however, have refused to let genetic predispositions or curvy aesthetics stand in the way of self-confidence. The dancers’ shapes are an accompaniment to their talent. Since Pretty BIG’s debut, Akira and her dance company have been receiving powerful messages from her audience. Akira has received thank you messages from many women and girls in distress. She told us about one woman who had stopped dancing because she gained two or three pounds and the dance community told her it would bar her from future success. This woman reached out to Pretty BIG to thank them for their work and for the inspiration to start dancing again. “It gave them confidence,” Akira’s manager says. Preparing for a trip to Los Angeles and then off to Africa, we were lucky enough to share some time with Akira to ask some hard questions. With a profound enthusiasm and caring demeanor, Akira tells us what competition is like in the industry, what the critics are saying, how to start a dance company and what she wishes she could tell all women. M: What is the overarching message and objective of Pretty Big? That your size does not define who you are. Our model is "size has no barrier." Do you see barriers with size in the dance industry? Yes and no. There has been one or two plus sized dancers sprinkled in who have gotten the opportunity to tour. There are a few. But there haven't been a plethora of plus sized women on stage or had their own tour because people are just not accepted as who they are as far as aesthetics. It's hard to start a company in any industry but dance is particularly competitive. What has been the biggest challenge? It's very competitive. One of the biggest challenges is getting our messages across concisely. A lot of people are saying that we are promoting obesity and that's not necessarily the case. We just promote body positivity. So, our inspiration comes from confidence and making sure that you do feel good about yourself and if you do choose to lose weight you do it on your own terms. You're not forcing yourself because you're socially uncomfortable or under-eating. Pretty BIG is a lifestyle for us. But it's hard to get the message across. 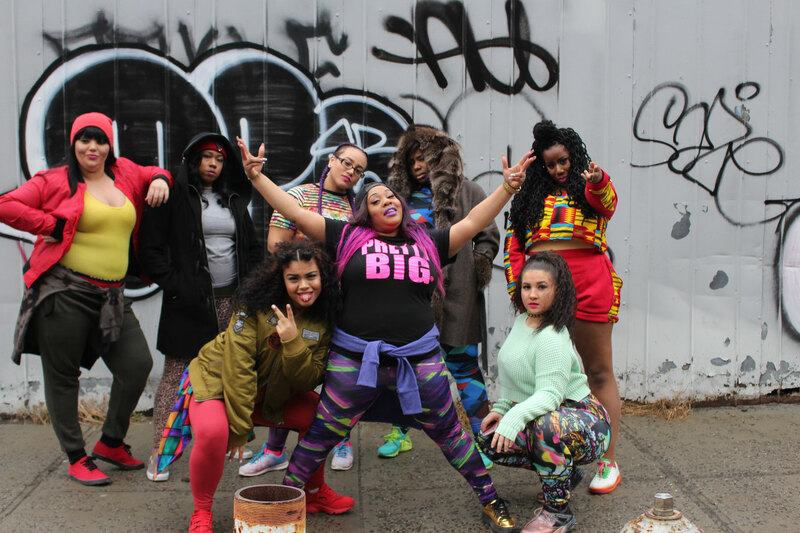 We had a few individuals kinda shoot some fire at us, saying that Pretty BIG shouldn't be a movement where plus sized people just dance to feel good about themselves and they don't need a platform to showcase, you know, that they can dance. Plus sized women are not accepted in mainstream media. In the last few years there have been some changes. For example, last year Lane Bryant participated in Fashion Week and not just Plus Sized Fashion week. But it hasn't been integrated completely [in mainstream media]. How do you overcome what do you say to those people? Do you fight back? We don't fight back. We let the fans fight back for us. 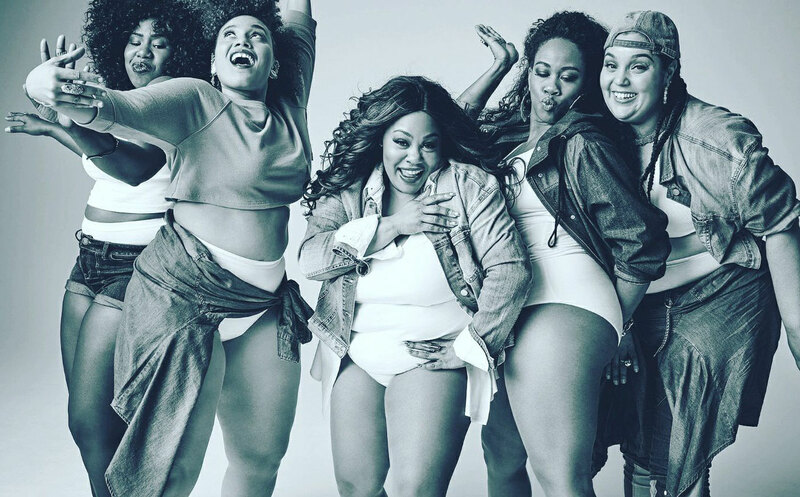 It's kind of like our little bee-hive, like Beyonce has her beehive [laugh] but we just keep moving forward and keep putting out more positive things and right now we are waiting for Pretty BIG's Lane Bryant campaign. [This has since been released]. So people are seeing some pretty great things coming from Pretty BIG. We try not to fall into the negativity, we let our fans and supporters take care of that for us. Already Pretty BIG has reached the world. They are [even] talking about us in Africa. All seven continents, they are talking about us. It's just an amazing feeling that we have people even in Taiwan. We didn't expect so many people, like those in Taiwan, to embrace our message. And they just did an article on us in Taiwan. We are excited that stereotypes based on appearance are starting to get shut down. What are the general steps involved in starting a project like Pretty BIG Movement? For example, what would you tell a young girl that wants to start a dance company or be a professional dancer? Where do they start? Well, first thing, is to rehearse. Two, if it's something that you are really passionate about, you want to make sure you have your business things tied in first. When I first started Pretty BIG, it was just an idea and I just went out there full throttle and started looking for other plus sized women. But along the way a mentor of mine sat me down and said you need to get these things in order first. So I got my LLC, I got the trademarking of my name, I made sure I made I took care of those things. You know, tax ID number. You have to do those things if you want to make it a business. If you just want to make it an extra-curricular activity, then you can do it as just a Saturday thing. But for me, I knew I wanted it to be a career. And so I took the necessary steps in business to take care of that. And then, all the other things started to fall into place. More people wanted to be involved and we got more members. It grew from there. As far as the young girl, we suggest, if you want your life to be as a dancer, you need to train! Because every one in Pretty BIG is a trained professional dancer. They are not someone who just dances really well in the club. These women, and professional dancers, have to breathe dance. These women have extensive backgrounds in Ballet, Temporary, Modern, African, Jazz, Tap, you know, so it's a study. It's a major they took on and studied. It's not just "Hey, I can dance real good, so watch me." They are trained. What's your favorite kind of dance project? If you could do anything right now, what would it be? Right now, because of the buzz, we are excited about what we are doing. We are starting to get a lot of bookings. I think that's what's exciting. We are getting ready to travel to LA, we are planning a tour in December to go to Africa. Being able to travel and showcase our talents is the most exciting thing right now. What kind of responses are you getting to Pretty BIG? We've been receiving messages from different girls and the type of messages that we have been getting has been overwhelming. We received a message from a young lady who actually tried to commit suicide twice and she was on her way to trying a third time so when she saw Pretty BIG video, it saved her life. We had women who stopped dancing because they gained two or three pounds, and you know, in the dance community, they found that unattractive and would send them away. So, when those women saw Pretty BIG Movement, it inspired them to start dancing again and not care what people say. It gave them confidence. We have women call us and say "I'm not plus sized at all but what can I do to gain weight to be a part of Pretty BIG?" This is the type of feedback we are getting back and it's overwhelming to inspire everyone. No matter what size you are, what color, how many toes you have, Pretty BIG is inspiring everyone, even men. We have interest in a men's segment because they see there are none out there. We have them knocking on our doors too. Is there anything you would like to say to your audience? Whether negative or positive, I just want the young women to know, and even women that gave up on themselves because they gained weight over the years, I just want them to know, that they are good enough. They are always good enough. Just remember that.